In this lifetime I’ve witnessed the revival of the Polynesian voyaging canoe. One time, a man I was married to—a newspaper reporter and a sail-boater (before DH)—was excited about meeting the artist Herb Kawainui Kane whom he had just interviewed. He saw Herb Kane’s beautiful paintings of double-hulled canoes under sail. 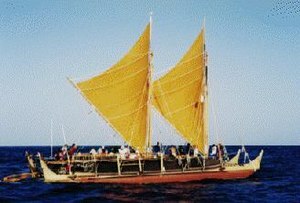 He learned of Herb’s dream to build such a canoe in Hawaii that would make a voyage across the Pacific to the land of his ancestors in the way that the Polynesians first came to the Hawaiian Islands. He had an idea of what the boats looked like, and he was in the process of figuring out how exactly how to build them. The reporter had crewed for Rudy Choy, a naval architect, from California to Hawaii on the Aikane II, a modern 65-foot catamaran built for his sunset dinner cruise fleet, on its shakedown voyage. He introduced the painter and the naval architect to each other, and that was about the start of the Polynesian Voyaging Society that celebrated the now-famous Hokulea’s 1976 voyage from Hawaii to Tahiti. I was young and just a “fly on the wall” at the time, but that tidbit is true and a treasured memory of mine. You can find out about Polynesian voyaging on this Polynesian Voyaging Society website. For more than a generation the organization has educated our island youngsters and the public with the ancient knowledge of traveling across the ocean without modern navigation instruments. PVS has played a major role in showing Native Hawaiians their ocean heritage. Six of the seven voyaging canoes at anchor in Kaneohe Bay at Hakipuu this afternoon. The blue-toned scene is from a rain squall. Fast forward 35 years to yesterday afternoon when seven Polynesian voyaging canoes called at “Hokulea Beach,” within Kualoa Park on Oahu where Hokulea was launched originally. These seven canoes began their voyage from New Zealand and are on their way to North America. They sailed from Nukuhiva in the Marquesas on June 2 and called at other Hawaiian islands to the east before reaching Oahu. With sails furled and anchors down, the celebration continued on land today, with ceremonies, exchanges of greeting, singing, dancing, and eating. 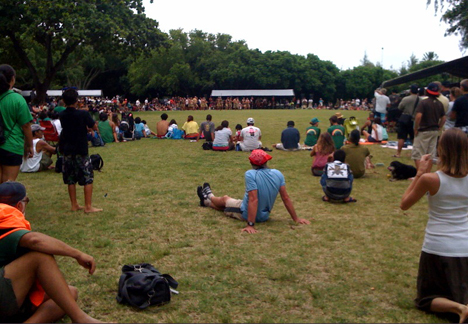 Oahu islanders and visitors enjoy festivities at Kualoa Park. DH and I rode our tandem bicycle from the studio to take it all in. Our tandem rig. 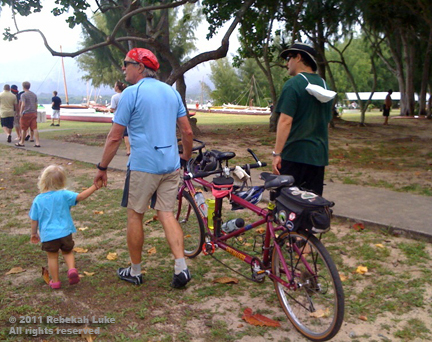 Miss Marvelous and her dad, far right, are anxious to show her Papa (DH) the canoes.